Every year, we take our children camping for Halloween. The campground has a Halloween contest and trick or treating and all kinds of fun things to do. We decided last year to take our dog with us and therefore had to come up with a costume at the last minute. We had a Winnie the Pooh one piece pajamas that 2 of my children wore when they were little. I cut it down the back and attached a red fabric cape to hide her body. Her front legs went in the leg openings and the arms I pinned together holding a pumpkin bucket. She was the hit of the weekend. We also entered her in our local Fall Foilage festival and she won the dog costume contest. This is a great way to recycle and reuse! 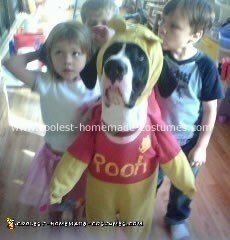 Molly loved her Dog Pooh costume and all the attention she got wearing it. Her wooden plaque hangs on the wall of our home just like the awards the children have received. Don’t buy new or throw out. Think of clever ways to use your items in a new way.